Identifying the right talent is a critical first step in ensuring that the company's business objectives are realized. And for doing so, recruitment professionals need to pay attention to few different steps in the process. According to a study, an average CV spends 23% of its lifecycle time in HR Screening (9.18 days) while top candidates do not stay on the job market for more than 10-12 days. This webinar will delve into the question 'how to ensure that the screening and shortlisting process is effective?' 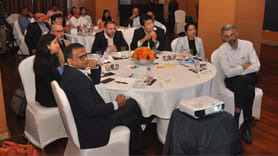 and 'how to use technology in the process to ease the recruiters' burden of manual screening of resumes?'. 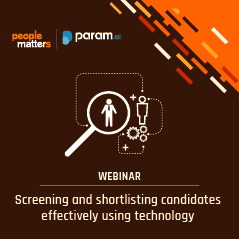 Listen to experts in the field as they delve into details about how technology can help recruiters with screening candidates better, with automation and data science. 1) What are the key pain points in screening and shortlisting candidates today? 2) How can recruitment professionals address the challenge of 'quality' and 'time to hire'? 3) What should be on your checklist to effectively screen and shortlist candidates? 4) What do you need to do to make the recruitment process effective, and in turn providing better candidate experience? 5) How can technology support you in making the process effective?